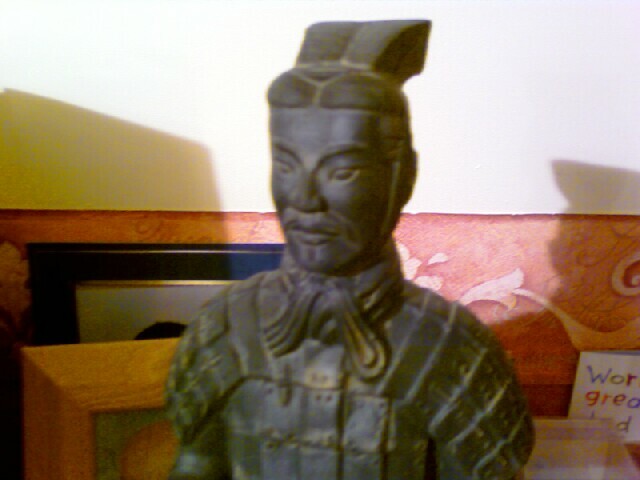 I went to the British Museum and all I got was this Terracotta warrior from China!! And the rather expensive book of the exhibition. Friday evening I went along to the First Emperor exhibition at the British Museum. I got there about 50 minutes before my ticket time to check out the queues and queuing system. You just had to queue up when your ticket time was being displayed and in you went. The lighting in the exhibition is quite dark, as if to convey the sense that you are entering a tomb. The high roof of the reading room helps with the tomb like atmosphere. There was stronger lighting on the exhibits themselves and the notes. The first thing you see as you climb the steps is an archer, crouched down holding his bow, as if waiting for the order to fire. The bow was missing as it had rotted away many hundreds of years ago. At least that is what you are supposed to see, in reality what you see is a crowd of people looking at the exhibits and standing around listening to their audio guides. After the first couple of sections the crowds started to thin out, presumably still in the first section listening to their audio guides. The sections guide you through the life and achievemens of the first emperor and how he unified much of what is now China. 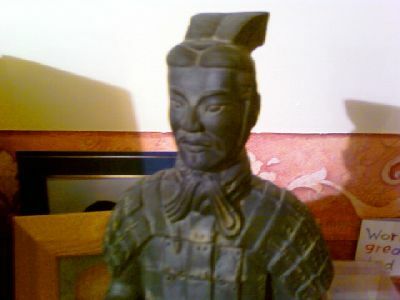 There are a large number of items on show that have never been seen before outside of China, most coming from various digs around the first emperors tomb. Finally, after studying his life, you are led through a doorway and we turn to his death. Here we find the terracotta warriors, horses, replica bronze chariot, administrators, acrobats, musicians and bronze birds. The warriors are quite impressive close up, considering that they were made over 2000 years ago and spent most of that time burried. Each has unique facial features and hair styles. Although none of them were found intact, there was a lot of restoration work done to repair them. This was clearly seen on the horses, although the warriors themselves looked like they had been restored very well. Finally as you are leaving the exibition there is a replica archer painted as he would have looked when he was first made. In his bright clothing and leather armour. They also ask the question about the future and if the tomb of the First Emperor will ever be excavated, who knows what secrets lie there. I didnt manage to get any sneaky photos inside the exhibition as there were a lot of staff wandering around to enforce the no photography rule. This is a must see exhibition for 2007/2008, but there are very few ticket slots available until the end of its run in April 2008. Although there are about 500 tickets available each day if you are prepared queue up for them.